Thanksgiving is a day full of family and friends, food, gratitude and timeless traditions. 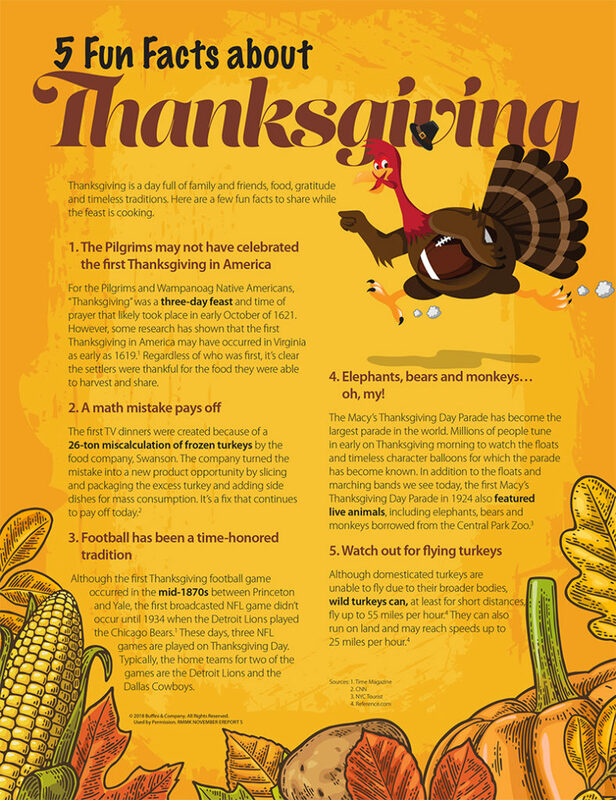 Here are a few fun facts to share while the feast is cooking. For the Pilgrims and Wampanoag Native Americans, “Thanksgiving” was a three-day feast and time of prayer that likely took place in early October of 1621. However, some research has shown that the first Thanksgiving in America may have occurred in Virginia as early as 1619. Regardless of who was first, it’s clear the settlers were thankful for the food they were able to harvest and share. The first TV dinners were created because of a 26-ton miscalculation of frozen turkeys by the food company, Swanson. The company turned the mistake into a new product opportunity by slicing and packaging the excess turkey and adding side dishes for mass consumption. It’s a fix that continues to pay off today. Although the first Thanksgiving football game occurred in the mid-1870s between Princeton and Yale, the first broadcasted NFL game didn’t occur until 1934 when the Detroit Lions played the Chicago Bears. These days, three NFL games are played on Thanksgiving Day. Typically, the home teams for two of the games are the Detroit Lions and the Dallas Cowboys. 4. Elephants, bears and monkeys…oh, my! The Macy’s Thanksgiving Day Parade has become the largest parade in the world. Millions of people tune in early on Thanksgiving morning to watch the floats and timeless character balloons for which the parade has become known. In addition to the floats and marching bands we see today, the first Macy’s Thanksgiving Day Parade in 1924 also featured live animals, including elephants, bears and monkeys borrowed from the Central Park Zoo. Although domesticated turkeys are unable to fly due to their broader bodies, wild turkeys can, at least for short distances, fly up to 55 miles per hour. They can also run on land and may reach speeds up to 25 miles per hour.